On Feb. 21, 2019, KrebsOnSecurity contacted Italian restaurant chain Buca di Beppo after discovering strong evidence that two million credit and debit card numbers belonging to the company’s customers were being sold in the cybercrime underground. Today, Buca’s parent firm announced it had remediated a 10-month breach of its payment systems at dozens of restaurants, including some locations of its other brands such as Earl of Sandwich and Planet Hollywood. Some 2.1 million+ credit and debit card accounts stolen from dozens of Earl Enterprises restaurant locations went up for sale on a popular carding forum on Feb. 20, 2019. In a statement posted to its Web site today, Orlando, Fla. based hospitality firm Earl Enterprises said a data breach involving malware installed on its point-of-sale systems allowed cyber thieves to steal card details from customers between May 23, 2018 and March 18, 2019. Earl Enterprises did not respond to requests for specifics about how many customers total may have been impacted by the 10-month breach. The company’s statement directs concerned customers to an online tool that allows one to look up breached locations by city and state. 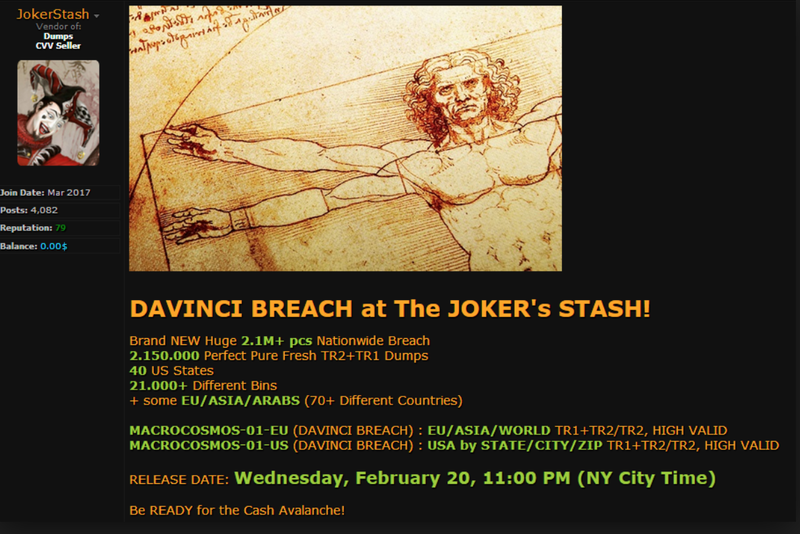 According to an analysis of that page, it appears the breach impacts virtually all 67 Buca di Beppo locations in the United States; a handful out of the total 31 Earl of Sandwich locations; and Planet Hollywood locations in Las Vegas, New York City and Orlando. Also impacted were Tequila Taqueria in Las Vegas; Chicken Guy! in Disney Springs, Fla.; and Mixology in Los Angeles.